Welcome to the show. I’m talking about doing a lease option on a property that needs a lot of work. I’m heading home from the airport after traveling for a speaking engagement. Here’s an exercise from yesterday’s REIA meeting in Phoenix where I spoke. Rehabbers are looking at a house that is literally full of junk. It has termite damage, needs a new roof and serious cosmetic work… at least $40,000 in rehab. Finished, the house should be worth about $320,000, maybe more. The investors offered $240,000. I think that’s a little high, but apparently in Phoenix that’s a good offer. But here’s the rub. The current owner owes $280,000 on it. My idea is to structure a lease option with a $280,000 contract. Rent will be paid while it’s being fixed up, and the sale will go through in a year or 2. Contractors love these kinds of deals. They do the work themselves as the tenant buyer. When work is complete, they can buy the house or sell it to someone else. Learn about crafting a lease option on a house that’s in bad shape and has little equity. Self-employed handymen/contractors are enthusiastic about lease options. Info on upcoming speaking gigs will be available soon. Hey everybody, welcome to REI In Your Car. What’s going on? I’m going to be talking today about how to do a lease option on a junker property on a property that needs a lot of work. Would you be interested in learning how to do that? All right, pay attention. So I’m just flying back home, I got home a few minutes ago driving home from Phoenix. I was in Phoenix the other day speaking at one of the local REIA’s there, had a good time. And one of the things that we talked about during the talk was a real deal. Like before I talked, they had this thing like Shark Tank where somebody brought up a deal and the two main investors that lead the group kind of acted like sharks from the shark show Shark Tank show and asked questions about the property and bid each other out to see who would get the property right. Pretty cool. So I’m going to give you the rough approximate numbers and tell you what I told the group because these two guys are wholesalers or rehabbers, right? They buy houses and either flip them and wholesale them or they will fix them up and rehab them. So this was a house that was worth about $320,000 and they walked through the pictures and needed a lot of work, probably about four or five dumpster loads of junk that was inside the house needed to be hauled out, had some termite damage, needed a whole new roof and cosmetic rehab, about $40,000 in rehab they were estimating that it needed, so it’s worth $320,000 to $330,000 fixed up needs about $40,000 in rehab and they offered the lady who brought the deal to them, $240,000 pretty good, right. What’s interesting, if you look at the typical male formula of, you know the ARV times 70% minus repairs minus fee, you probably should have been down closer to, I don’t remember the exact numbers, probably closer to $210,000 I think. But these guys were offering $240,000 so I’m somewhere around there and I looked at it and looked at the numbers and talk to them later on. And you know, in Phoenix the market is so hot right now that they can be instead of .70 cents on the dollar of ARV minus repairs, they can be at like %80 or 82% of ARV and still do well on a deal like this. So anyway, they were offering $240,000 on a house that was worth $320,000 okay. What if the seller owed $280,000 on that house? What could you do with that deal? Hmm, well good question I’m glad you asked. You could possibly do at least option on that deal, right. Now, no wholesaler is going to give that seller $280,000. Because if you put $40,000 into it, you’ll be all in for what it’s worth today and you’ll have no room to make any profit and sell it and things like that. So what do you do? Well maybe you could do a lease option on the house. Now a lot depends on the underlying mortgage on the property and what it will rent for, but it’s a really nice area. It’s a three car garage and nice backyard really good solid comps. So $320,000 they felt was a real conservative value. It might even sell for $330,000 or $340,000 but what if the seller owed $280,000 what could you do with that? Well you could structure it as a lease option? What if he told the seller something like this? Listen, I, you know, I’d have to be at $240,000 you want $280,000 I don’t think I can make that work, but I don’t know if this will work for you, I don’t know. What if, what if I could lease the property from you and either me or one of my buyers could fix it up and we’ll make the payments every month and then buy it in a year or two. That wouldn’t work for you, would it? He said, I just did, I asked a question. I sold the benefits of a lease option and phrased it as a question. So I said, I don’t know if this will work. Can we maybe would, if me or one of my buyers could lease the property while we fix it up and then buy it at the end of a year or two. And you won’t have to pay any realtor commissions and all that stuff, but that wouldn’t work for you, would it? And the seller, let’s say, they say, yeah, that might work. So here’s the cool thing about this if you structure it and you look at the numbers, and I’m going to kind of screw the numbers up because I’m driving right now and I’m tired jet lagged. But it would be pretty simple. So you would, you would sell it as a handyman special lease option. And let me just say this, every time I have done a handyman special lease option on a house, I’ve gotten flooded with phone calls. Those things sell like crazy hotcakes. Why? Because there’s a lot of handyman contractors, people that can fix up houses themselves that would love to do a rent to own on a property so they can fix it up, put the flooring they want in and do the colors that they want, the kitchen that they want, the bathroom, that they want, all that stuff, right. And then while they’re working on getting their credit up to par, they can actually get a mortgage, you know. So there’s a lot of people out there. Their self employed, their contractors, maybe they’re oh, what’s the correct, proper politically correct term, immigrants, undocumented immigrants or something like that I don’t know. Like there’s a lot of them and they got money to put down on these houses. So I would turn around, I would give the seller at least option contract for $280,000 with, let’s say this house. I’m just looking at what I remember from the are. It rents for about $1,800 or $1,900 a month, maybe $2,000 a month. I would want to make sure I have at least 25% of the rent into the cash in the cash flow. If I’m going to stay in the middle if I’m not going to stay in the middle, then I just give the seller whatever the market rent is. So let’s say the market rents are 1800, there’s probably not enough equity for me to stay in the deal. So I would give the seller at least option contract. I would lease it from the cellar for $280,000 at $1,800 a month in rent because I know I could rent that property pretty quickly for $1,800. You know what fact, let me rewind a little bit. Let’s say the seller’s mortgage payments or $1,700 a month, I whatever the mortgage payments where I would offer the seller $1,700 a month in rent to cover the mortgage payment. Because when I turn around and advertise that property, I’m going to get much more calls if it’s, you know, $100, $200 less than the market rents in that area. So I would try to offer the seller $1,700 a month in rent, $280,000 a lease option. It was for an option price. Now that house has, oh, hold on a second. So that house doesn’t have much equity in it, you’d think, but if the contractor gets in there, does it themselves, they can probably get it all done for like $10,000 or $15,000 just for labor and materials, right? So they don’t have to pay for labor. They can do it all themselves. So they’re getting a smoking hot deal, they’ll probably be, put $10,000 to $20,000 in it for the materials and their own labor. Maybe they outsource a little bit of it to a contract or sub it out or something like that. But they can get a lot of that done themselves. And so they’re getting a house at a bargain price. They’re getting it for $280,000. Now maybe you could, you know, get the, convince the seller to clean it out, pay some money to just hire some laborers to come and clean it and dumpster everything put it, haul it away, right? But then you just turn around and advertise it for lease option and you could probably get easily $5,000 to $10,000 a on a lease option from a tenant buyer. You just sell your lease option contract to the tenant buyer and then you’re done and out of the deal you’re done and out of the deal so you can structure it where the tenant buyer with your contracts has to fix the house up before they move in so you have a very clear list of what needs to be done and you have a very clear detailed instructions that they have to pull any permits if they have to pull permits and if it has to get inspected by the city or code enforcement or whatever that has to happen. But you’ve structured now a great deal on terms. You can turn that around and assign or sell that lease option contract for an easy probably in this case, $10,000 pretty easily, pretty quickly. And I’ve done lots of these they’re great way to do lease options to do deals that other wholesalers would just throw away because it needs too much work, there’s not enough quote unquote equity. And so they pass on these deals. When you, since you’re smart and you’ve listened to the Real Estate Investing Mastery Podcast, you know better, you’re going to offer a lease option and sell that contract. But what if you can’t find a buyer for it, then you don’t, you can’t, you won’t. So you’ll just, you don’t, you won’t, you’re not losing any money, right. Except maybe a little bit of time in your advertising and marketing. But anyway, I got to go. That’s all I wanted to share. Had a good time in Phoenix. I’ll be speaking next in Cincinnati, Ohio I think coming up soon and Atlanta, Georgia, I’ll be letting you all know more about that. I enjoy speaking once in a while. Not a ton. I don’t like traveling that much, but when I do, I love meeting new folks and speaking and traveling and meeting investors around the country, doing some pretty cool things. We’ll see you guys later. Hey, if you want my book where I talk about lease options, Go to, excuse me, WLOBook.com WLOBook.com get my book for free. Just pay shipping and handling. 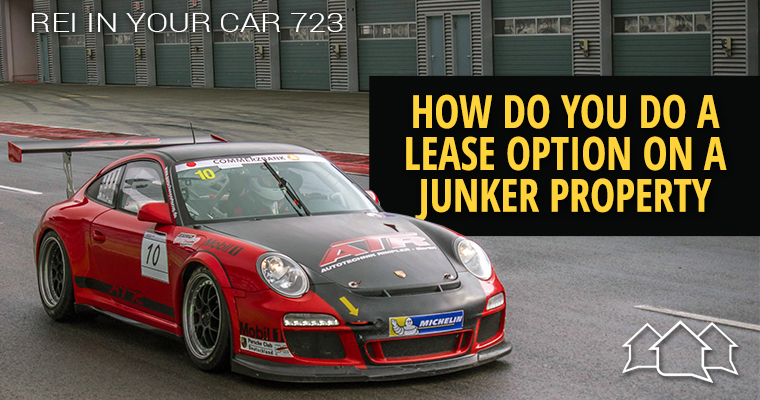 Talk all about lease options and you’ll get some good content in there. Go to WLOBook.com see you guys.